A big ‘thank you’ to Richard Meeks of Frank Key for their generous sponsorship. 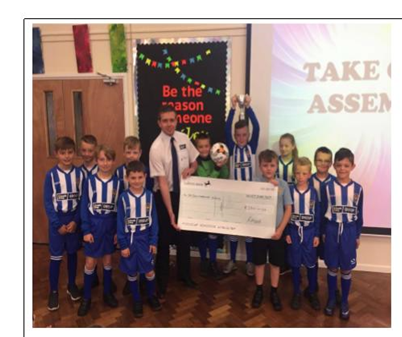 Richard Meeks of Frank Key was invited to Sir John Sherbrooke Junior School on Friday 16th June to present a cheque for £250 for their new football strip which was designed by Ryley Dunkin in Y4. Richard was very pleased to be supporting our football team who won the inaugural Calverton Challenge Cup against St Wilfrid’s 4-3 in a very exciting and close match played at William Lee Playing Fields (their new home ground). Mr Knott, Sherbrooke’s PE coordinator, also wanted to acknowledge the exceptional help and support from Calverton Parish Council who have agreed to maintain the pitch as well providing goals and corner flags for next season when we return to the Gedling league after a six year absence.